"Developing Artists is the place that has always allowed me to express myself. Growing up as a young adult in today's world, I feel it is the only place that has taught me that there are no right or wrong answers, that it's okay to spill your milk and cry over it, and that there are other people out there who understand me. Thanks for that!" Developing Artists is a place where all the performing arts come together - acting, singing, spoken word, rap, poetry, music, dance - to create. 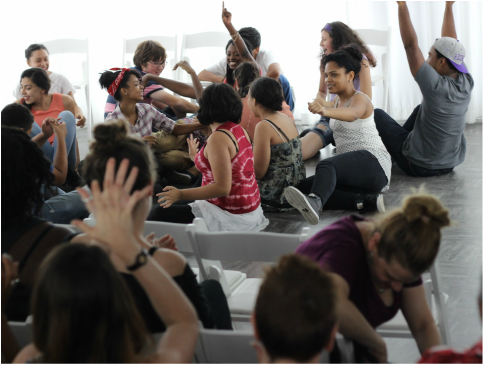 Students are exposed to fundamental theater arts techniques designed to build confidence, explore self-expression, empower their creative voice and instill professionalism. DA is a safe space where students are encouraged to speak freely. ​All working professionals, create a positive, nurturing and fun environment allowing both beginning and advanced theater students to work creatively as an ensemble. Developing Artists' teachers have worked both on and off-Broadway, in television, film and have taught at the most recognized performing arts institutions. Developing Artists Class sessions are for teens 13 - 19 years old. All students must go through an interview process before being accepted into our program. Class size is limited to ensure the individualized attention and support needed for young developing artists. "My kids, Max Woertendyke and Lia Woertendyke spent a lot of time at Developing Artists. It was a real good place for them. They met a lot of other creative children from different areas in and around the city. Almost 15 years later they have continued friendships and working relationships with a number of them. They worked on new original plays and established ones as well. Max has gone on to be a working actor. Lia is director of an after school arts and literacy program in the public schools. She still makes art and performs. As a mom I felt secure when they were studying or rehearsing. I knew where they were. I knew it was positive. I was proud of the work they did. Thank you Jill DeArmon for being another positive adult person in their growing up life."